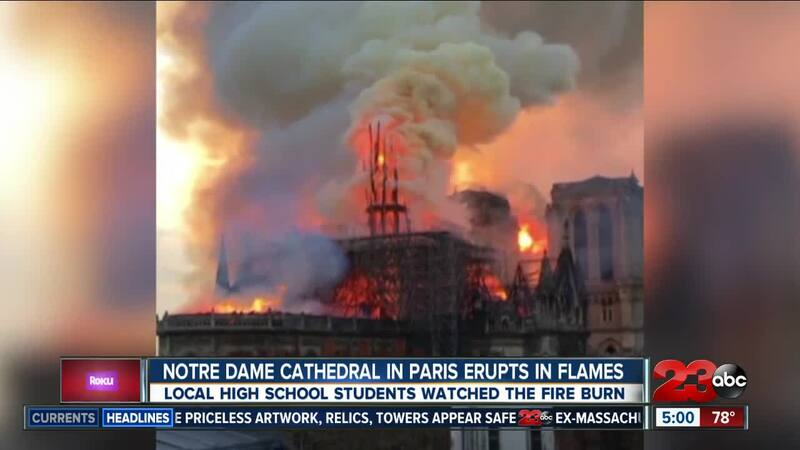 A group of about 25 Bakersfield students witnessed the Notre Dame Cathedral burning in Paris on Monday, April 15. The students were in Paris as part of a educational travel trip with American Council for International Studies (ACIS) , according to a parent of one of the students in attendance. One student from Independence High School, Kimberly Gibbons, shared photos and videos with 23ABC of the building burning. Her mother, Dalene Schlottach-Gibbons, said that Kimberly Gibbons is the only student on the trip from Independence High School but that students from Stockdale High School were there, as well. Gibbons said they had toured Notre Dame just hours before the fire started. They were eating dinner nearby when the flames erupted. Gibbons said people rushed toward the Cathedral when they saw the flames. "Everyone is like what's going on and at first it was just ash but then there were live embers falling into my hair and it burned my friend's jacket," said Gibbons.